BOCA RATON, FL -- (Marketwired) -- 01/15/14 -- CRC Press / Productivity Press is pleased to announce that five of its recent publications have been awarded the prestigious Shingo Research and Professional Publication Award. This prize is presented to authors who advance the Lean body of knowledge into new areas and promote a broad understanding of operational excellence. "Productivity Press is honored to have these four books recognized at the Shingo Conference. The Shingo Professional Publication Award recognizes and promotes books regarding new knowledge and understanding of Lean and operational excellence. These awards make it clear that Productivity Press continues to publish the most practical books on the cutting edge of process improvement and Lean transformations." Lean RFS (Repetitive Flexible Supply): Putting the Pieces Together (May 2013, ISBN: 978-1-4665-7819-7) by Ian Fraser Glenday and Rick Sather uses proven examples and quantifiable evidence to demonstrate that repetitive flexible supply (RfS) is not only possible, but that its implementation can help readers reach a new level of improved performance in manufacturing and across their supply chain. Ian Fraser Glenday is a Senior Fellow at the Lean Enterprise Academy in the UK and a Principal at Repetitive Flexible Supply, Ltd. in the UK. Rick Sather is the Vice President of Customer Supply Chain for North America Consumer Products at Kimberly-Clark Corporation. 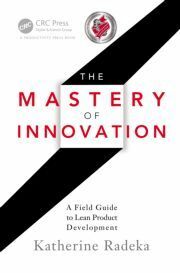 The Mastery of Innovation: A Field Guide to Lean Product Development (October 2012, ISBN: 978-1-4398-7702-9) by Katherine Radeka describes the experiences of 19 companies that have achieved impressive results from Lean Product Development. The diverse set of case studies drawn from North America and Europe illustrate scenarios across the automotive, medical devices, industrial products, consumer electronics, pharmaceuticals, scientific instruments and aerospace industries. Katherine Radeka has a rare combination of business acumen, scientific depth and the ability to remove the barriers to change. Her consulting firm, Whittier Consulting Group, Inc., has engaged with clients such as Steelcase, Hewlett-Packard and more than 50 other leading organizations. 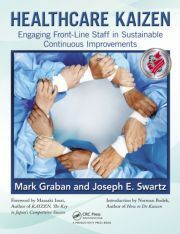 Healthcare Kaizen: Engaging Front-Line Staff in Sustainable Continuous Improvements (June 2012, ISBN: 978-1-4398-7296-3) by Mark Graban and Joseph E. Swartz covers the management mindsets and philosophies required to make Kaizen work effectively in a hospital department or as an organization-wide program. It shares some of the methods used by hospitals around the world, including Franciscan St. Francis Health, where co-author Joseph E. Swartz is currently the Director of Business Transformation. Mark Graban is an internationally recognized expert in the field of Lean Healthcare, as a consultant, author, keynote speaker and blogger. Mark is currently the Chief Improvement Officer of the software company KaiNexus. Lean Leadership for Healthcare: Approaches to Lean Transformation (April 2013, ISBN: 978-1-4398-7296-3) by Ronald G. Bercaw illustrates the leadership behaviors required to achieve sustainable success in the healthcare industry. It outlines a management system for sustaining Lean improvements and provides the Lean leadership approaches, thoughts and visual tools required to guide an organization toward world-class healthcare performance. Ronald G. Bercaw is the President of Breakthrough Horizons, LTD, a management consulting company specializing in the application of the Toyota Business System. The 12 Pillars of Project Excellence: A Lean Approach to Improving Project Results (October 2011, ISBN: 978-1-4398-4912-5) by Adil F. Dalal provides groundbreaking techniques to help readers achieve excellence in project leadership that can result in failure-free projects. It unveils novel solutions and breakthrough concepts to help readers chart the most efficient path to the pinnacle of project leadership. The book includes powerful tools for organizational- and self-assessment on an accompanying CD. Adil F. Dalal is the CEO of Pinnacle Process Solutions International®. Mr. Dalal is a keynote speaker, author and an internationally recognized thought leader in project leadership and Lean/Advanced Flow Technology. Productivity Press, part of CRC Press, is the premier source of information on organizational improvement. CRC Press is the principal science and technology book division of the Taylor & Francis Group, an Informa company.